This is the first time to experience this installation in the States and it will only be available for six months as part of a limited engagement. We're gonna have to keep our VR HMDs on a swivel as we look for banana peels. The unofficial Mario Kart tour in Tokyo is out of commission, but an exciting, albeit unrelated, virtual reality project is now headed to the United States. HTC Vive announced today that it is partnering with Bandai Namco to bring Mario Kart VR to a limited-time virtual reality installation. In the Washington D.C. area, Bandai Namco is launching the VR Zone Portal, which has already gone live in Japan and the UK, in Amusement America at Union Station. Mario Kart VR will be one of the featured games at the location, along with games like Argyle Shift and Ski Rodeo. In this immersive take on the Mario Kart games, the HTC Vive tracker allows players can reach out of the karts themselves to grab the various powerups to us during the race, like the classic banana peel. The game also features haptic feedback, making the player really feel like they're driving around a track. Argyle Shift is a single-player VR game where players are cast as test pilots on their way to drop a giant robot into a designated zone and it features motion seats. Ski Rodeo has player immersed in a high-speed descent down the slopes. As stated in the press release, these experiences will only be available at Union Station for six months. The partnership between them and Bandai Namco is a limited one, so act quickly and set your travel plans! I'm curious as to how that deal was achieved. 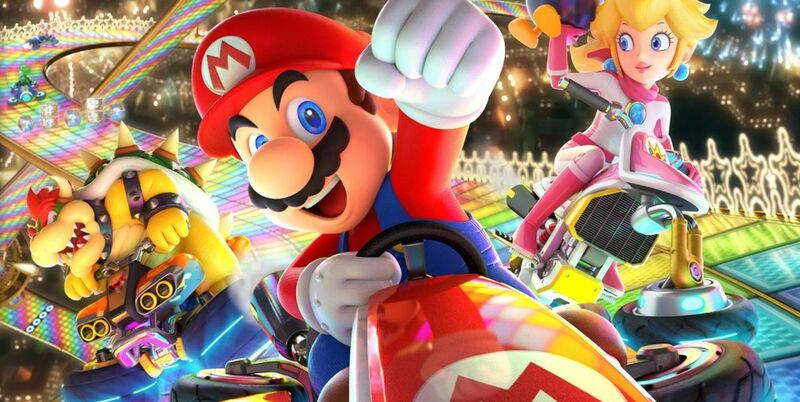 Mario Kart is a huge IP for Nintendo. I wonder what They got out of the deal. An HTC Vive Switch would be amazing.